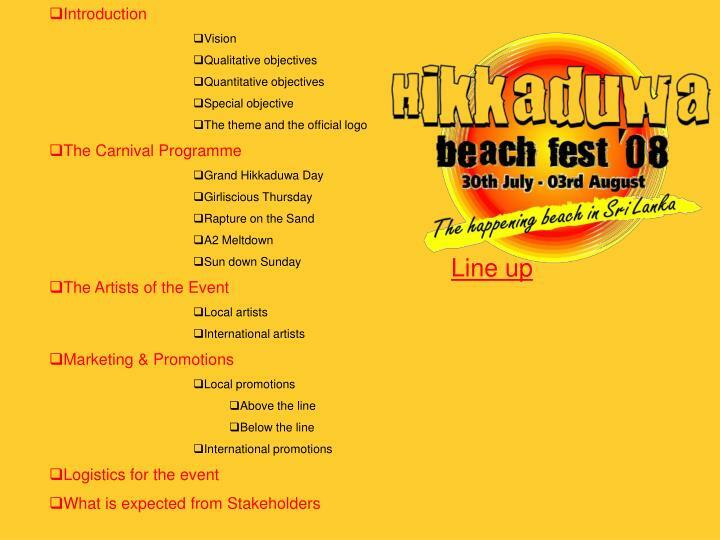 To promote Hikkaduwa as the “Entertainment Strip” of Sri Lanka, thus developing it to as an iconic festive beach destination. 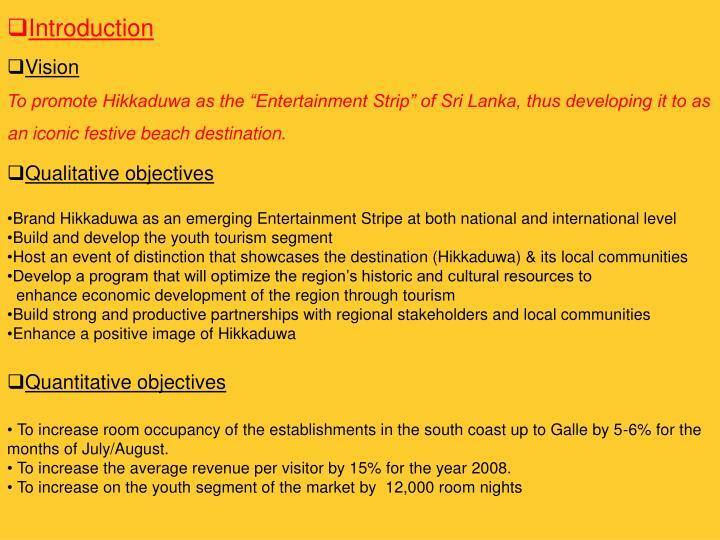 To increase room occupancy of the establishments in the south coast up to Galle by 5-6% for the months of July/August. To increase the average revenue per visitor by 15% for the year 2008. 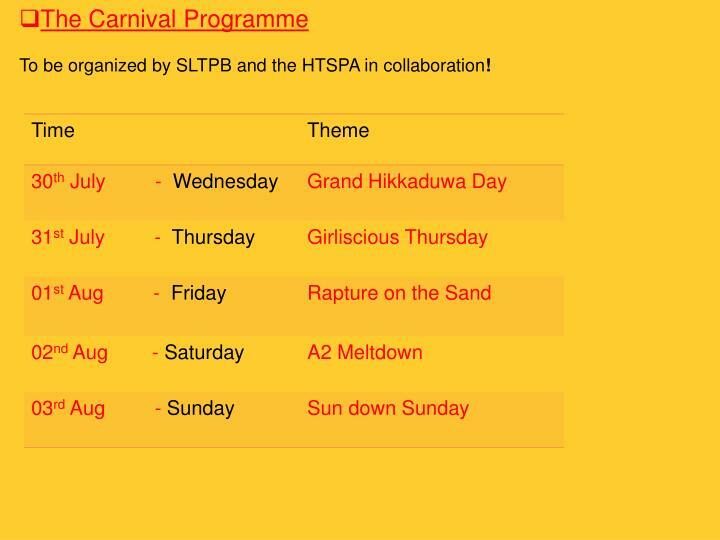 To be organized by SLTPB and the HTSPA in collaboration! Takes the form of a procession with all participants in fancy dress. The theme of this fancy dress will be “Welcome to summer, the Sun and The Sea”. Entries will be invited from individuals, schools, local youth organizations, clubs and businesses. There will also be marching bands, musical entertainment, traditional dancing and street entertainers in the parade and around the parade route. The whole event will be free to spectators, however corporate businesses will be charged an entry fee, as it will be providing advertising for their business/products. 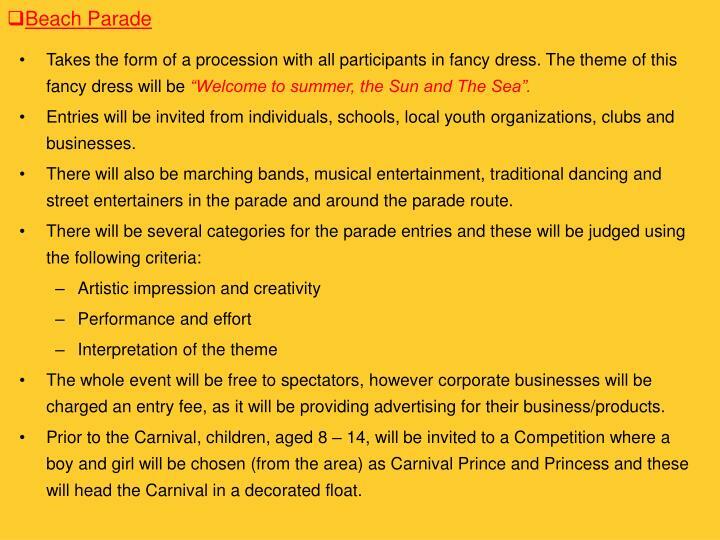 Prior to the Carnival, children, aged 8 – 14, will be invited to a Competition where a boy and girl will be chosen (from the area) as Carnival Prince and Princess and these will head the Carnival in a decorated float. Art and photography exhibition-for schools, community groups and amateur individuals. Local crafts people to be invited to display and sell their goods. 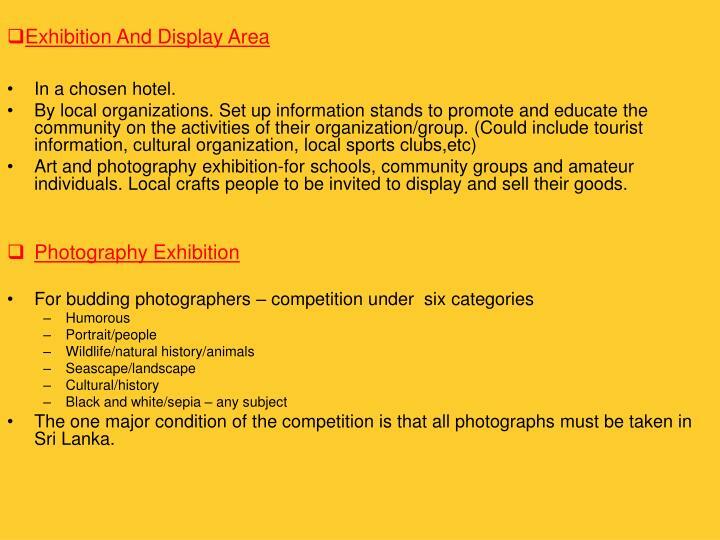 The one major condition of the competition is that all photographs must be taken in Sri Lanka. 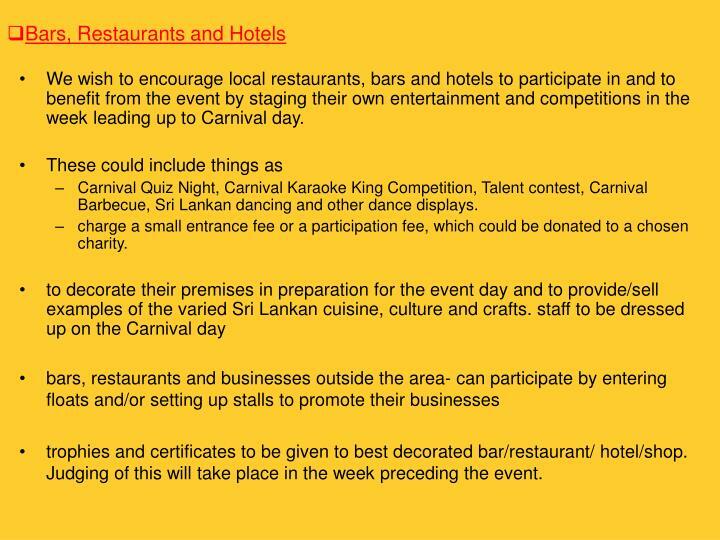 We wish to encourage local restaurants, bars and hotels to participate in and to benefit from the event by staging their own entertainment and competitions in the week leading up to Carnival day. 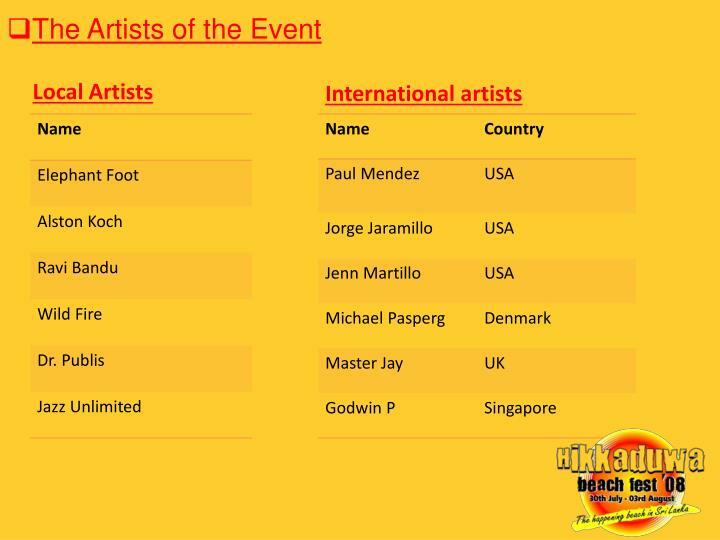 Carnival Quiz Night, Carnival Karaoke King Competition, Talent contest, Carnival Barbecue, Sri Lankan dancing and other dance displays. charge a small entrance fee or a participation fee, which could be donated to a chosen charity. trophies and certificates to be given to best decorated bar/restaurant/ hotel/shop. Judging of this will take place in the week preceding the event.